Alaska is taking credit for proving plate tectonics. OK, that’s an exaggeration. 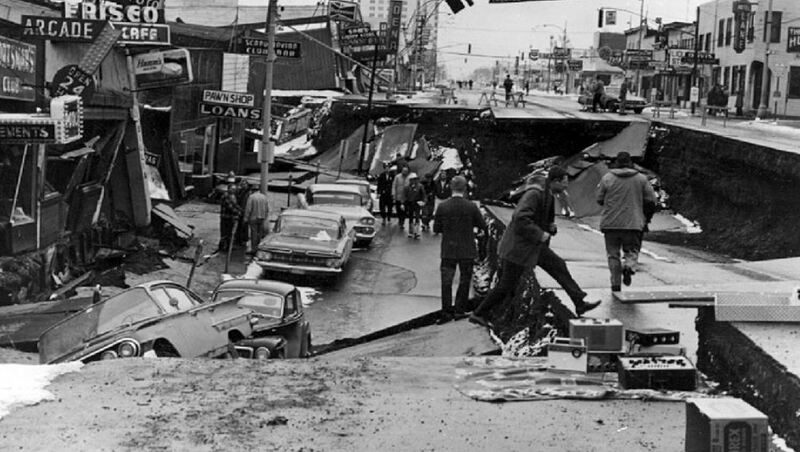 50 years ago, in March 1964, an incredibly powerful 9.2 Magnitude earthquake shook Alaska. We are being told that “the quake proved a theory that was just then surfacing in seismology – plate tectonics,” according to the author of the article you’ll find at the other end of this link. Well, some will argue that plate tectonics has yet to be proven. Others will point to positioning data amassed in the past decade from GPS and lasers as the proof, not the 1964 earthquake. But the timing of the quake – just as plate tectonics was becoming widely accepted – at least put the science in the news on all those little black&white TVs back in those days. The earthquake demonstrated what one may expect when the plates decide to become tectonic. This is news because starting Monday this week, a party of sorts is happening in Anchorage. OK, again an exaggeration. Engineers are involved, so it will hardly be a party. Every four years the National Conference on Earthquake Engineering meets to discuss the latest in technology and feats of engineering and design. Next week’s conference, NEES Quake Summit 2014, will showcase the latest ideas of 800 (!) presenters. This entry was posted in Engineering, History and tagged Alaska, earthquakes, history. Bookmark the permalink.